New Evening Legion of Mary Praesidium Forming! Brothers and Sisters in Christ: Our Blessed Mother wants active and auxiliary members to join Her Legion. Assist in waging war against the enemy by winning souls for the Crucified Christ!! Join a nearly 100 year old lay apostolate movement founded on a profound devotion to Our Lady. Our Lady of the Immaculate Conception Praesidium meets Tuesdays at 10:00 a.m. in the Brother Leo Room. The new evening praesidium will begin Tuesday, November 14 at 7:00 p.m. in the Brother Leo Room. Contact Jim 704-649-0618 (evenings) or Marci Lynch 704-299-0992 (daytime). New morning active members always welcome too! 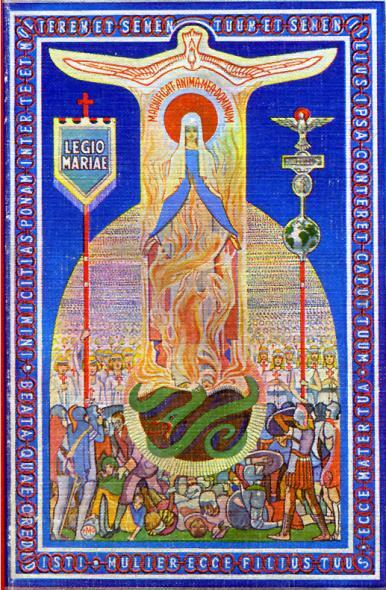 Legion of Mary is a world-wide lay apostolate in which Catholic men and women sanctify themselves through prayer and spiritual works in union with Our Lady under the guidance of the pastor of the particular parish. Fellow Brothers and Sisters in Christ: Our Blessed Mother wants active and auxiliary members to join Her Legion. Assist in waging war against the enemy by winning souls for the Crucified Christ!! Join a nearly 100 year old lay apostolate movement founded on a profound devotion to Our Lady. Our Lady of the Immaculate Conception praesidium meets Tuesdays at 10AM in the Brother Leo Room. Contact Mark Myers at 704-614-6778 or psalm100mjm@yahoo.com. Note: We are having a membership drive the weekend of August 12 & 13 with an information table in the back of Church after each of the Masses.